Let us say it is a nice, sunny morning and you have just arrived in Berlin. As an art enthusiast, you have probably decided to check into one of those charmingly designed art hotels, because you enjoy being surrounded by art. You have a whole day ahead of you and want to start exploring Berlin’s cultural heritage. And you’ll probably start doing that in Berlin Mitte. With so many historic landmarks, a vast number of galleries, and abundance of public art on the walls, Mitte is the right way to begin your artistic journey through the capital of Germany. However, it won’t be long before you discover that Berlin is one of those cities where you’d need months, not days, to visit all spots that might be interesting for art lovers. But you’re eager to see as much as you can before the end of your journey, and you’ll be probably staying outside as much as possible. Since you’re only human, you will occasionally need to take a rest, and all that walking will eventually make you hungry. At that point, you’ll be glad that we’ve prepared a list of some of the best Mitte restaurants where you can take a break, enjoy great food and atmosphere, and fill in on that energy you’ve lost during the sightseeing. As any visitor, what you’ll certainly want is to get a taste of local cuisine. 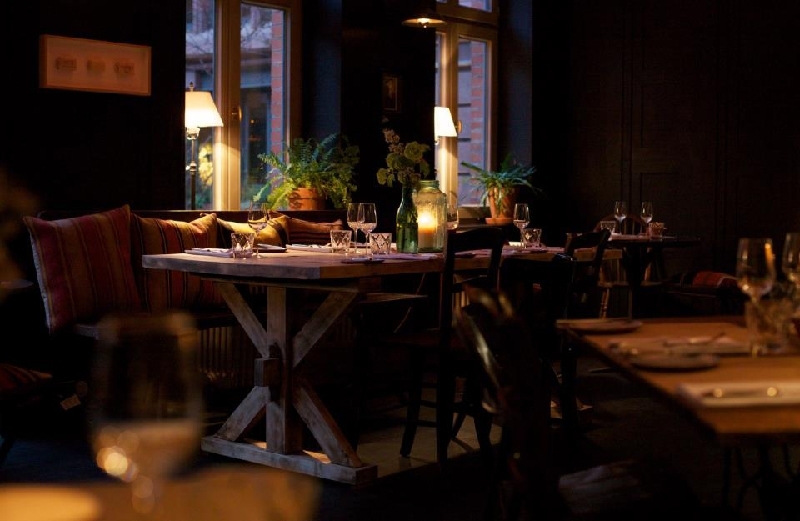 Located on Gartenstrasse, in the heart of Berlin, Alpenstueck specializes in homemade south German cuisine and it is a nice combination of modern ambiance and traditional German fare. Apart from the restaurant, Alpenstueck has its own bakery and workshop, which means that everything you order will be handcrafted, prepared with fresh regional products. 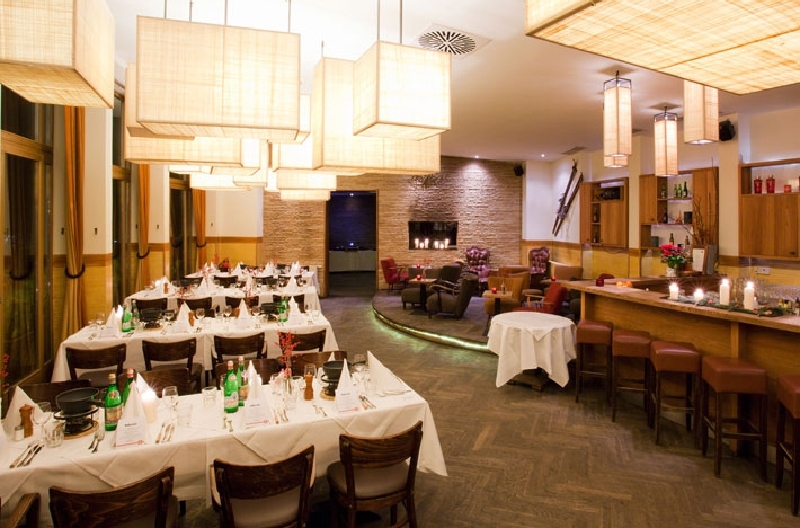 The menu is dominated by traditional Austrian and south German meals and it is a great place to enjoy classics like “Wiener Schnitzel“, “Kaesespaetzle“(Cheese noodles), or apple strudel. In addition, if you are a wine lover, you will not be disappointed with the selection of best wines coming from Germany and Austria. And while we’re at that authentic local feel, why not visit Clärchens Ballhaus, one of the oldest dance halls in Berlin dating back to 1913. The food is mostly traditional German or Italian, and the establishment takes a lot of pride in its wood stove pizza. 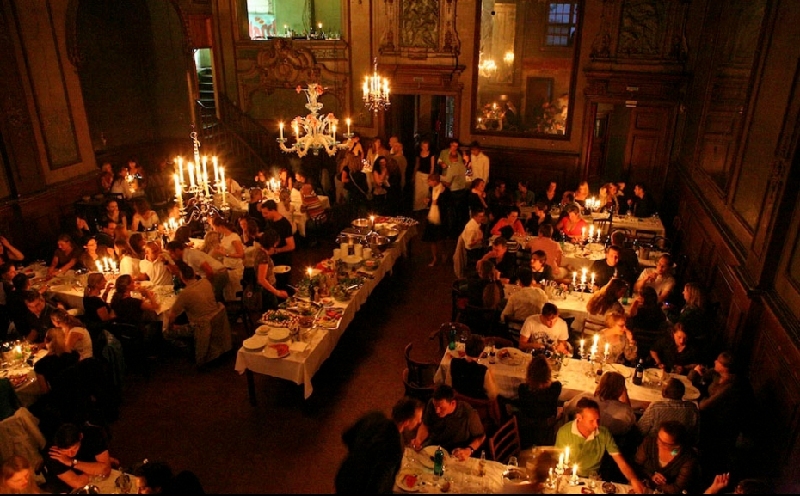 Nonetheless, if you’re visiting Clärchens Ballhaus it will not be solely for the food, but also for its unique fin-de-siècle vibe coming from two beautifully designed ballrooms that will take you back through history, bringing a taste of nightlife of a different era in a city known for its vibrant clubbing scene. In just one evening, you may learn how to swing, waltz or tango, and enjoy nice meals and versatile selection of drinks in between. 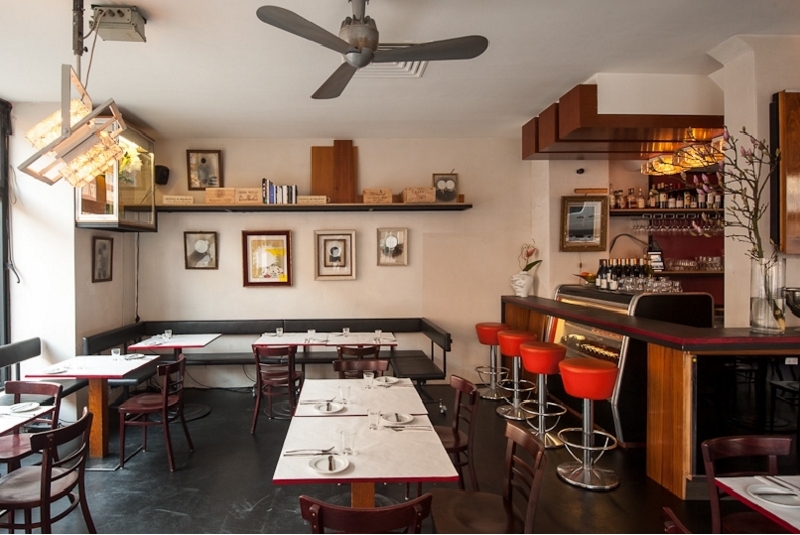 Lively, intimate, and romantic are perhaps the best words to describe the unique atmosphere of Clärchens Ballhaus on Auguststraße. With its beautiful terrace overlooking the Volkspark, the restaurant Nola’s am Weinberg is a perfect place for those who like to dine outdoors, while watching the sunset and escaping the noisy atmosphere of the German capital. 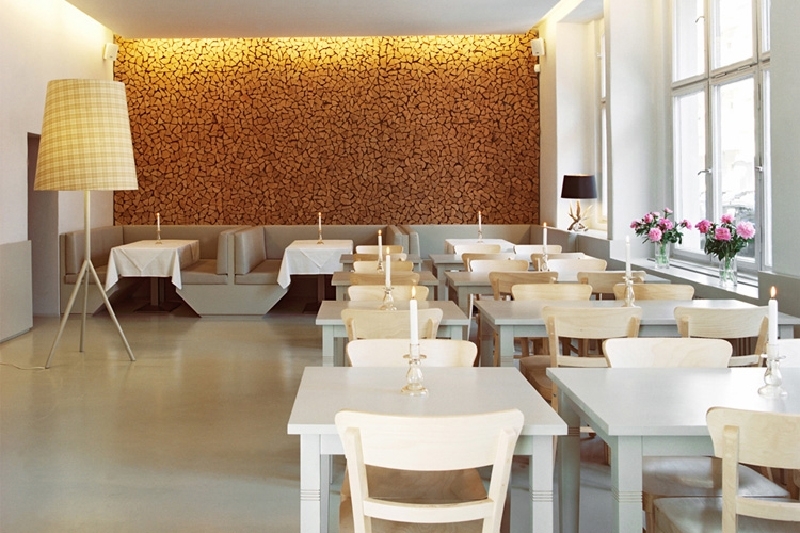 The venue in an old 1950’s park pavilion offers modern Swiss Alpine cuisine and is a great choice if you’re visiting Berlin with your children. On Sundays, they have a great brunch buffet with a delicious variety of Swiss cheese, sliced sausage and ham, homemade jam, cooked and scrambled eggs and great salads. And when it comes to the traditional Swiss cheese fondue, there is no place like it in the city. If you are a vegan, you probably know how hard it is to find a nice place that can serve your needs and for a reasonable price. Kopps restaurant and bar on Linienstraße can certainly offer one of the best vegan dining experiences and its reputation in this field is unsurpassed. The restaurant takes pride in its unique, creative and personalized approach to food preparation and presentation. Seasonal, organic ingredients, regional products and fresh herbs from Brandenburg area are those features that make Kopps food so tasty. It also offers delicious brunch options on Sundays and their cocktails are just extraordinary. If you want to enjoy some fresh vegan meals in a casual and cozy atmosphere, Kopps is the right choice for you. 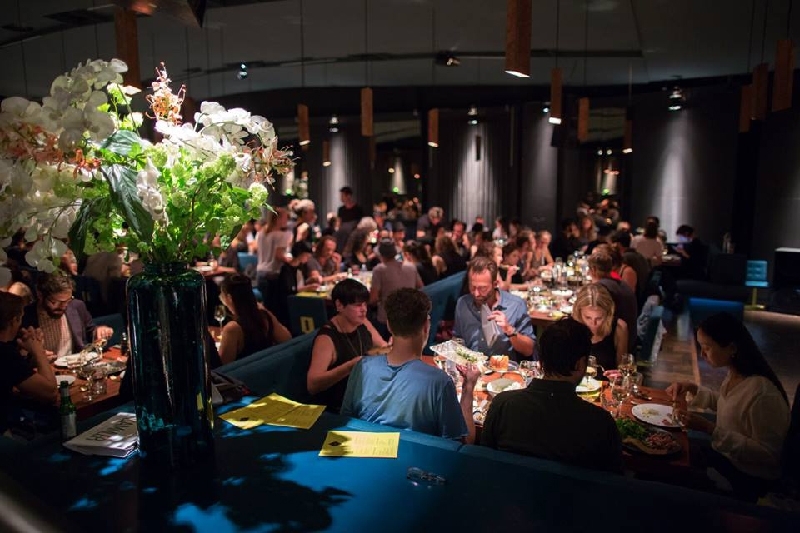 Located in Friedrichstraße, where Cookies nightclub used to be, Crackers is one of the most exciting new restaurants, once you manage to find the entrance, hidden behind the show kitchen. Crackers is a perfect choice for those who want to fuel up before continuing to some of Berlin’s notorious nightclubs. With DJs playing music there four times a week, the whole dining experience in Crackers gets close to being in a club. With a modern take on the traditional cuisine, dining at Crackers will appeal equally to gourmands and those of taste that is more classical. The restaurant is a bit fancy, but not in a pretentious way, and it’s a perfect choice for young adults who are not looking for a particularly intimate dining experience. The location is widely praised for its vibrant, upbeat and funky atmosphere. 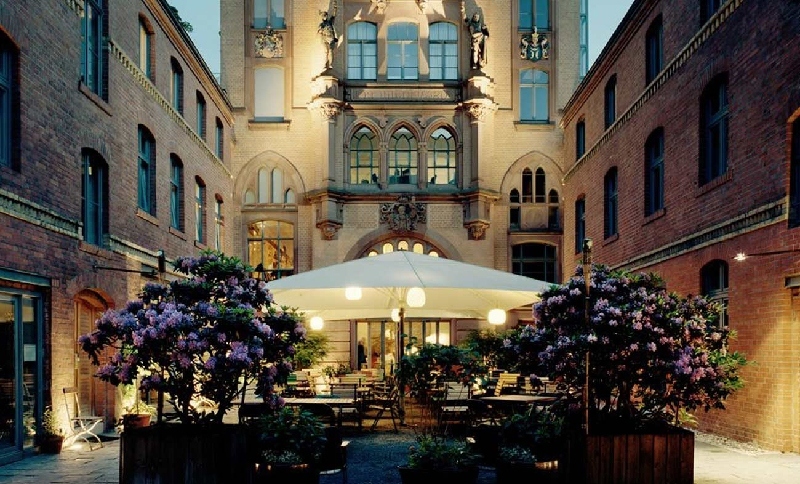 The bohemian design, along with particular rustic charm juxtaposed to modern art pieces on display is what makes Katz Orange one of the most popular restaurants among Berlin Mitte artsy crowd. It is located in an old brewery, with architecture resembling a church, or a chapel, and it adds to the overall spiritual and comforting atmosphere the place is praised for. Inspired by various world cuisines, the staff is dedicated to serving the best of regional and seasonal ingredients, prepared with much love and care. If you’re visiting Katz Orange, make sure you try some of their slow cooked meat specialties, but if you’re not into meat, know that they have an excellent menu of vegan dishes. The venue on Bergstraße 22 is also a great place to try some spirits from small German distilleries, so don’t miss on the opportunity. Let’s say you have been in Berlin for a couple of days now, and you are getting a bit tired of German food in its traditional and modern versions. If you find yourself craving for something different, like some of those classic French dishes, for instance, 3 Minutes sur mer is a right place to go to. Designed in a traditional style of a French bistro, along with the open kitchen and interior décor in art deco style, this restaurant on Torstraße offers some great food options, from nicely prepared fish dishes to uniquely French escargots in garlic butter and foie gras pate. The menu is accompanied by an excellent selection of delicious wines, which will leave even the most demanding wine lovers satisfied. 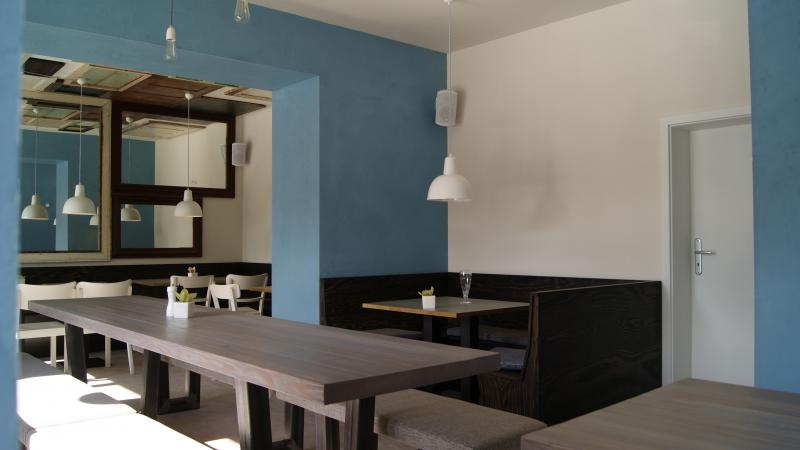 Located on Anklamer Straße, near Rosenthaler Platz, restaurant Ula is the best choice for those who want to get a taste of Japanese fare in its modern coating. When translated to English, Ula means “unexpected”, and it is exactly what awaits the visitors of this venue. 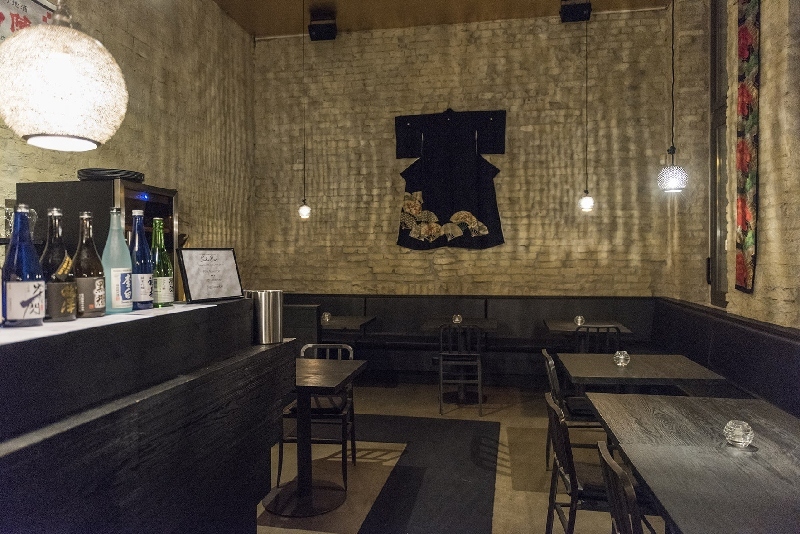 The restaurant is well known for its creative and imaginative food combinations, a mixture of traditional cuisine of Japan with the Western counterparts. Dedicated to promoting the country’s heritage, it also features a gallery, presenting the best of national craftsmanship. It is a place where history meets contemporaneity through food and ambiance. And let’s just mention a great selection of sake to motivate you further for visiting this awesome place. And we’ve left the sweetest thing for the end. 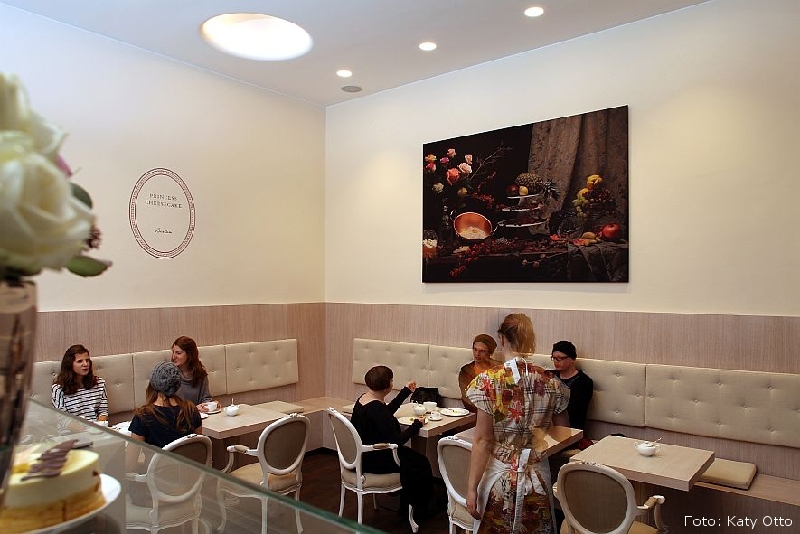 This lovely patisserie and café on Tucholskystraße is one of the best venues of its kind in Berlin. It tends to get crowded during the day, but if you are an early bird, you will certainly catch the opportunity to enjoy your morning coffee with a masterpiece of a cheesecake. With a versatile selection of cakes, coffees, and teas, Princess Cheesecake can meet all customer demands and satisfy almost any taste. The place is charmingly decorated, as are the cakes made of finest seasonal and regional ingredients. And when you’re done with their cheesecake specialties you can try equally good tarts and leave the place with the sweetest smile on your face.